RetroSound®'s Wonderbar™ is the most technologically-advanced radio ever made for your classic 1949-56 Cadillac Series 60S. Wonderbar™ is SiriusXM-Ready™ and connects to the SiriusXM™ SXV300 Connect Vehicle Tuner (sold separately, subscription required). The SXV300 plugs directly into Wonderbar™ without the need for special adapters or cables. The compact size installs easily and discreetly behind the dash for a fully integrated look. Wonderbar™ is Made-For-iPod®/iPhone®, and also features built-in Bluetooth® connectivity for hands-free phone calls and wireless audio streaming. 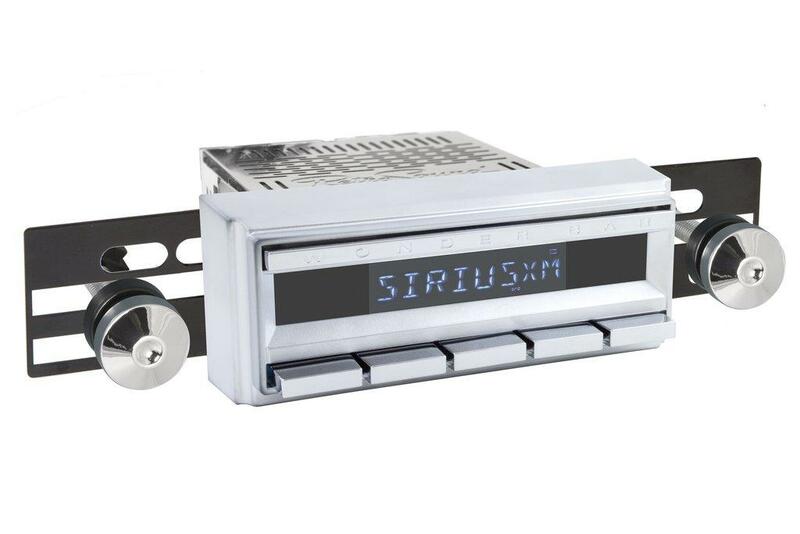 This radio features a working Wonder Bar -- use the Wonder Bar to tune up and down on the radio or with SiriusXM and use it to sort through folders on your iPhone® or flash drive. It features a 32,000 color display to customize your radio to your vehicle's interior. Two USB ports for iPod®/iPhone® or MP3/WMA music files plus two standard auxiliary inputs are included. Wonderbar™ has a built-in 25 watts x 4 channel power RMS MOSFET amplifier as well as front and rear RCA pre-outs, plus subwoofer output, to add external amplifiers. It mounts seamlessly into your dash, with no additional faceplates or bezels needed. Customers purchasing the SXV300 SiriusXM™ tuner are eligible for a $70.00 rebate and will receive a three-month subscription to SiriusXM™’s All Access Package upon activation. * The SiriusXM™ “All Access” package includes Howard Stern, every NFL, MLB®, and NBA game, every NASCAR® race, plus NHL® games and PGA TOUR® coverage, as well as access outside the vehicle to SiriusXM™ on smartphones and other connected devices and online at siriusxm.com.